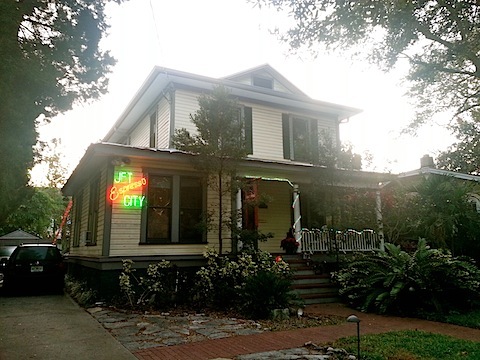 I cannot say enough great things about Jet City. Jess knows her coffee, so all of the drinks are outstanding. 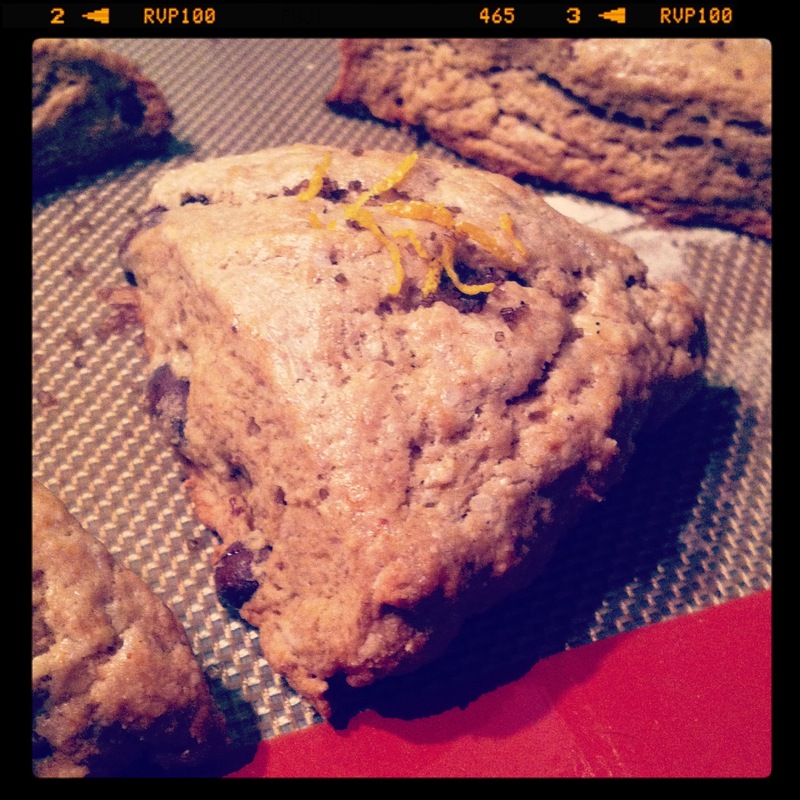 She also makes a variety of scones, ranging from savory to sweet, with a few Paleo options thrown in as well. My “go to” order is a tall, skinny Cafe Borgia and a rosemary goat cheese scone. 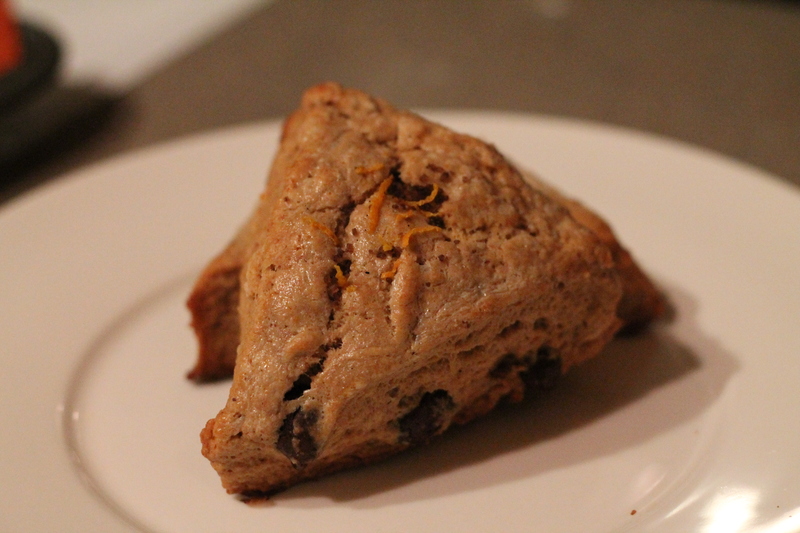 The sweet drink paired with the savory scone is THE best way to start my day. Cafe Borgia is the drink Jet City is known for! espresso, a touch of honey and orange blossom, steamed moo, fresh whipped cream, nutmeg and orange spritz! There’s something about this combination of flavors that is just so comforting- and addicting! It’s dangerous for my wallet that I work so close to her shop! 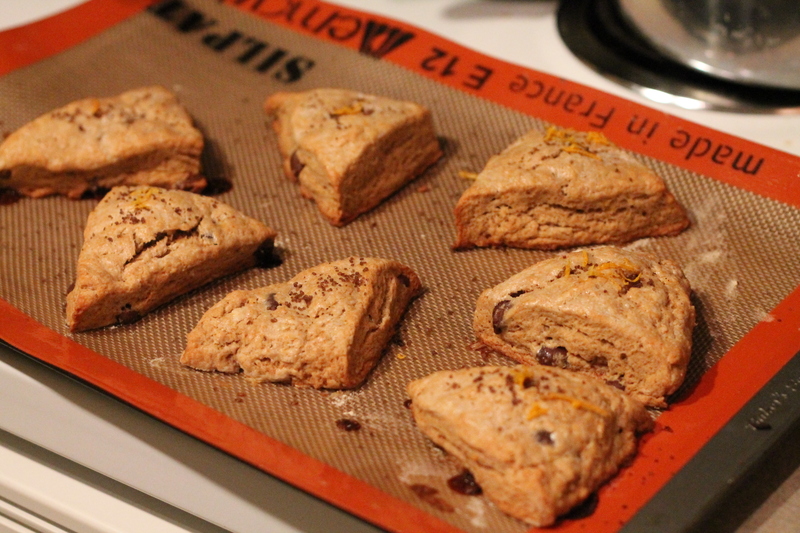 The other day the thought crossed my mind to make scones inspired by the Borgia. I tossed around a few ideas in my head- Include chocolate covered espresso beans? Throw in some candied orange peel? 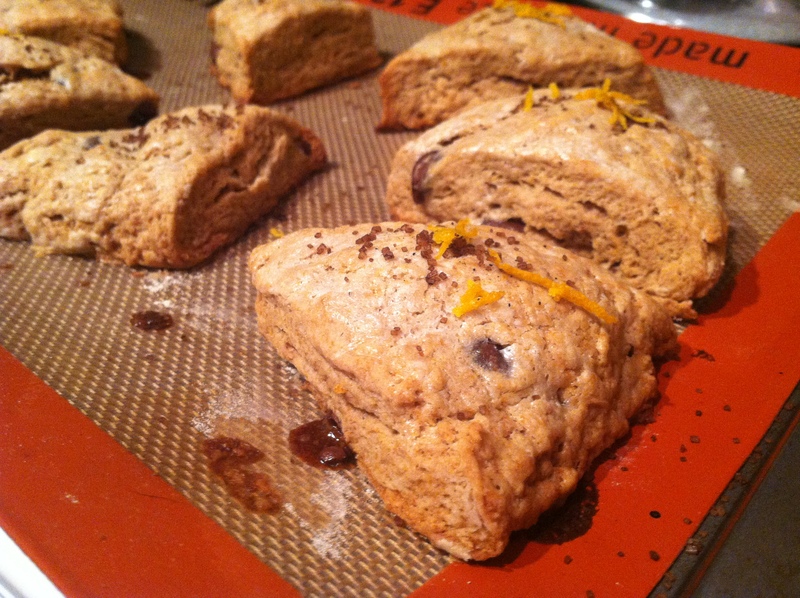 Base the recipe on an cappuccino scone recipe, or just make some swaps in a cranberry orange recipe? I settled on an chocolate chip espresso scone recipe and made the adjustments I thought necessary to make them more Borgia-like. With the additions of orange blossom honey, orange zest, a dash of nutmeg and some chocolate covered espresso beans, I think I got pretty darn close to perfect. In a measuring cup, mix espresso powder with 1 teaspoon hot water. Stir to dissolve. Add 1 cup cream and combine. 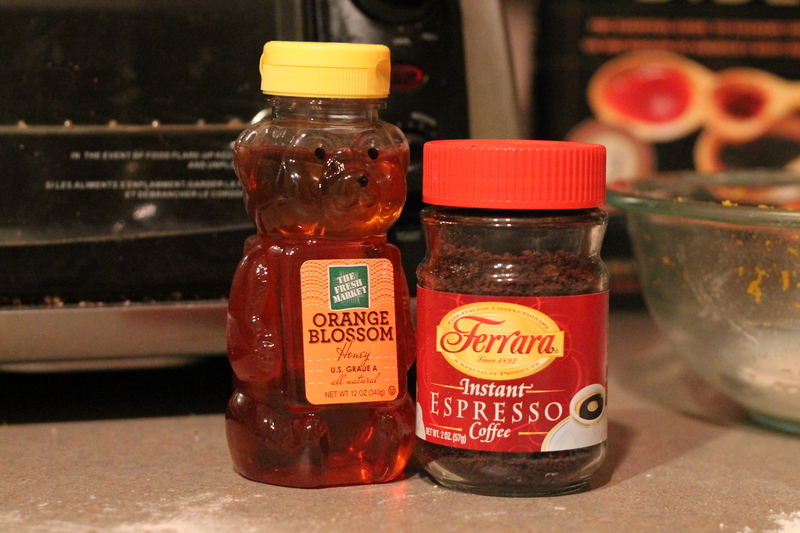 Add the orange zest to the creamy espresso mix. In a large bowl, mix together the flour, baking powder, sugar, honey, nutmeg and salt. Add the butter pieces to the bowl and using your hands or a pastry blender, cut in the butter. Toss in the chocolate covered espresso beans and stir gently. Pour the espresso-cream mixture over the flour mixture and blend with your hands or a spatula until dough just comes together. Gently knead a couple times, but don’t overmix. Remove dough onto floured surface. Form into a rectangle, about 3/4 to 1 inch thick. Cut the scones into desired serving sizes. Place the pieces on a parchment or Silpat lined baking sheet. Brush scones with cream and sprinkle with sugar. Bake scones until edges and bottom are golden and they are firm to the touch, about 15 minutes. Cool on a wire rack. Cafe Borgia sounds like such a romantic place…a place where I could get lost in a good book for hours. 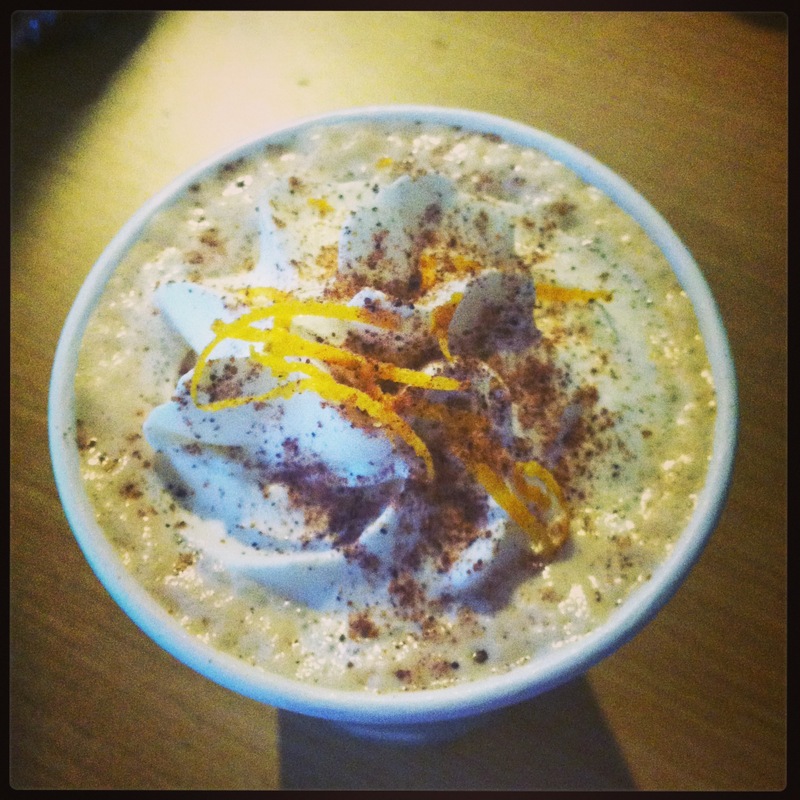 Is that orange peel on your hot drink? Um yeah. Uh-mazing. 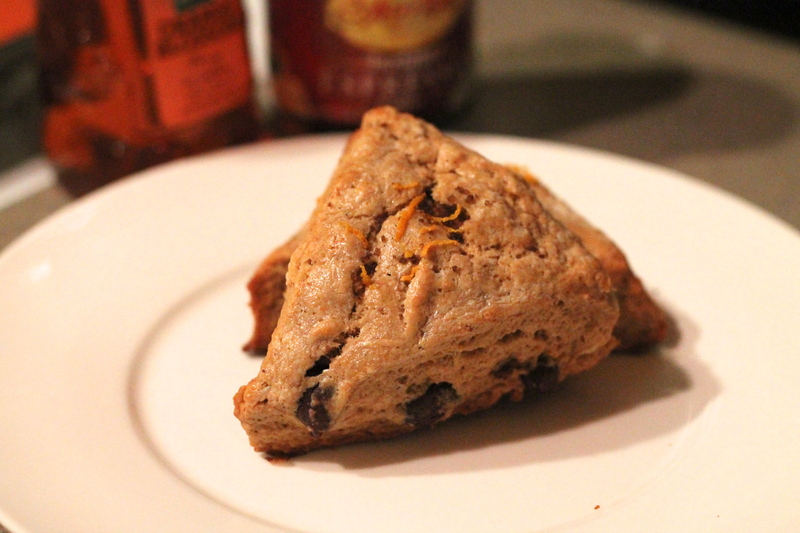 I’ve never made scones before, but this recipe sounds like it’d be worth a try! Sounds and looks delicious. Thanks for sharing, Steph! The drink is fabulous! The hint of orange is just outstanding!